Lacombe County took a big step and agreed on Thursday to spend $700,000 to build a trail from Blackfalds to Lacombe. The paved walking and biking trail would provide a six-km link to trails being built in Blackfalds and Lacombe . . .
A rotting historic bridge in Red Deer County will get a repair job. County council unanimously approved spending up to $350,000 on the 98-year-old Mintlaw Bridge, a former Canadian Pacific Railway Ltd. span across the Red Deer . . . The main trail in the natural Springbrook Park has now been paved. The new trail along Airport Drive was paved a couple of weeks ago. The new Springbrook sign at the entrance to the hamlet along Airport Drive is under . . . The perils of walking and cycling along Hwy 2A between Red Deer and Penhold will be lessened when a trail is built between Springbrook and Penhold in the next year. But there are no immediate plans to build a trail between . . .
A promenade connecting various recreation, sporting and culture facilities will form the spine of a major overhaul planned for southeast side of Red Deer's downtown. The city's recreation, parks and culture department has now . . .
Red Deer County will use a City of Red Deer parks development plan for the river valley as a guideline for future expansion of trails and other recreational areas. The city adopted its River Valley and Tributaries Park Concept . . .
Trekking together along Highway 2A, heading north towards Red Deer from Penhold, a family from British Columbia continued to marvel at their first look at vast prairie farm fields, bright yellow canola crops and a horizon that goes . . .
City Council adopted a trails and parks planning tool Monday night in the form of the River Valley & Tributaries Park Concept Plan. The long-term plan's purpose is to identify lands best suited for potential trails and parks within the . . .
Two issues have come in conflict in Sylvan Lake with residents wanting both a new skateboard park and the preservation of an abandoned rail line that has become a cherished park but not the two projects together. The town . . . The grand opening of the Blindman River Bridge held last Saturday marked the successful completion of a long-term project which will serve as a key link of the TransCanada Trail, that links communities from coast to coast. The event, . . The dream to have a recreational trail for hikers, bikers and roller bladers from Red Deer to the far end of Lacombe County is one step closer thanks to a pedestrian bridge over the Blindman River. The grand opening of the project on . . .
A two-km trail from Blackfalds to the new pedestrian bridge over the Blindman River will be built this summer despite a failure to convince a couple of property owners to sell strips of their land for the project. Lacombe County . . .
A heavy-lift helicopter was brought in from British Columbia Wednesday to install two walking bridges in Red Deer's Maskepetoon Park. It was the latest step to develop the ecologically sensitive park, which is located on the north side . . .
A crew of soldiers who helped build a bridge for hikers and bikers will join in celebrating its grand opening on International Trails Day, Saturday, June 5. Members of 41 Combat Engineer Regiment helped install the bridge . . .
A pair of bridges are now finished and progress is being made on a regional trail running between Penhold and Ponoka, says the president of the Central Alberta Regional Trail Society. CARTS members, including the various . . .
Red Deer County's Open Spaces Master Plan has received the Recreation Industry Excellence Award for Parks and Open Spaces from the Recreation for Life Foundation. The County, along with consultants Dillon Consulting and . . .
Army Reservists have completed their portion of the construction of Blindman River pedestrian bridge ahead of schedule and will not be on site this weekend, an Armed Forces spokesman said Thursday. Great weather, great . . .
Canadian Army reservist engineers from the Edmonton-based 25th and Calgary-based 33rd Engineer Squadrons of the 41st Combat Engineer Regiment, which is also based in Edmonton, donated about $50,000 worth of their time . . .
Red Deer's parkland is anticipated to grow by more than 7,135 acres by the time the city's population increases to 300,000 in the next several decades. The City of Red Deer is working with Red Deer County on extending the city's . . .
A Tar-ific Construction worker passes timbers to a colleague working inside the foundation of the new Blindman River walking bridge south of Blackfalds Monday. It and another over the Battle River in Ponoka are part of the . . . Enough Lacombe County landowners have warmed to the idea of a trail on their land so that a route from the Blindman River to Blackfalds could be ready this summer. "It's been a bit of a challenge for us in negotiating," said . . .
Work to install the new 140-foot long walking bridge over the Battle River is nearing completion. The bridge north of the 57th Avenue train crossing was built by Will's Welding, and after it was placed on pilings by crane, a crew from . . .
Jason Witvoet of Will's Welding in Ponoka works to connect the bridge structure to the piles on a bridge over the Battle River in Ponoka on Thursday. Over 13,000 kg of steel went into the construction of the pedestrian bridge, which will . . .
Work is to be finished by the end of March on pedestrian bridges connecting the Central Alberta Regional Trail. With support from the Town of Ponoka and Lacombe County, members of the Central Alberta Regional Trail Society are . . .
Red Deer County council today unanimously agreed to purchase the former Alberta Central Railway Mintlaw trestle west of Springbrook from Canadian Pacific Railway for $1 in exchange for a tax receipt for $8.8 million, determined . . . The federal government is providing bridge financing for a bridge in Ponoka. Wetaskiwin MP Blaine Calkins announced Oct. 14 that the Town of Ponoka will receive federal funding to construct a pedestrian bridge over the . . .
A seasoned marathoner is on the run to improve trails around six Lacombe lakes and ponds. Lacombe resident Bill Nielsen helped organize Sunday's first annual Lacombe in Motion Walk/Run involving more than 200 participants. . . The Town of Ponoka has received a federal grant of $185,000 to build a pedestrian bridge over the Battle River on its portion of the Trans Canada Trail. To be administered by the National Trails Coalition, the grant dovetails with an . 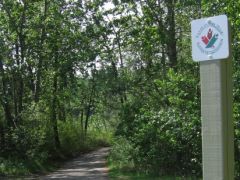 . .
Army engineers and an injection of cash from the federal government will help kick-start the Lacombe County leg of the Trans Canada Trail. Wetaskiwin MP Blaine Calkins announced Tuesday that the federal government will . . .
Red Deer County has started construction of a trail system in the treed and meadow natural area south of the hamlet of Springbrook and Airport Drive. The main spine of the trails is part of the Trans Canada Trail system with branch . . .
(bouquet) to the troops of the Canadian Forces who are mobilizing in Central Alberta to help blaze the way for a portion of the Trans-Canada Trail. This trail is of immense importance to all Canadians, and a boon to the tourist industry, by . . .
(bouquet) Still on the walking trail, a bouquet to Lacombe County for recognizing the importance of this project by expressing enthusiasm, backed by a donation of $50,000 worth of building material for the Blindman River bridge. . .
(dart) And still on the walking trails, a dart to those opposing this exciting venture. In particular, some members of the rural community who argue that they don't want city folk invading their properties. For the most part, the trail plan . . . The Canadian Armed Forces is mobilizing to help build a pedestrian bridge in Lacombe County. Army engineers have agreed to donate their time and expertise for the $300,000 bridge over Blindman River as part of a walking trail . . . The Rocky Mountain House to Nordegg trail is expected to cost $6.8 million to complete. The three-metre wide trail, much of which will be along the old rail line, will have washrooms, garbage cans, picnic sites, signage and a few . . . Adding new paths in a west-end neighbourhood and at a new off-leash dog park are part of this year's trail enhancements for Red Deer. 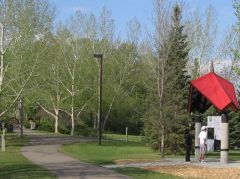 The City of Red Deer is working on various sections of the pathway system, including . . .
Two new bridges are expected to be built this year for trails crossing the Blindman River and the Battle River. The Central Alberta Regional Trail Society has been working on the project with Lacombe County, the Town of Ponoka and . . .
Raising money for the trail systems in Central Alberta is as simple as slipping into your hiking boots, sneakers or sandals, taking a photo and sending it to the Central Alberta Regional Trails Society. The society is collecting . . .
Central Albertans are invited to come out to Trails Day at Kerry Wood Nature Centre on June 13, from 10 am to 12:30 pm. Sponsored by Central Alberta Regional Trails Society, the event will kick off at 10:15 am with a Leave No Trace . . .
Red Deer city council recently passed a resolution urging the province to consider trail construction as part of the building or rebuilding of roads and highways. The resolution will go to the AUMA (Alberta Urban Municipalities . . .
(bouquet) to the County of Red Deer, for making trail development through the county a priority. Trails connecting Springbrook to Penhold and Spruce View to Dickson, and a Cottonwood day-use area near Dickson Dam, have been . . .
Red Deer County hopes several recreational pilot projects will help them move forward with its Open Spaces Master Plan. Trails connecting Springbrook to Penhold and Spruce View to Dickson, and a Cottonwood day-use area near . . .
Red Deer County council got their first look at the Open Spaces Master Plan at yesterday's meeting. Officials from Dillon Consulting were on hand to present the report to council, which they've been working on since 2005. The Open . . .